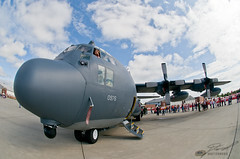 I didn't get a chance to tour the Lockheed Martin C-130 Hercules at the 2009 Selfridge Air Show, but there was a long line to walk through. The fisheye lens brought out the huge nose as a young guest looks out the Pilot's window. Maybe I'll have that chance next time.